Much like Farm Bureau lets your voice be heard through our grassroots policy development process, our constitution gives us the power to elect our leaders. Take advantage of this opportunity and find the value in voting on November 6. 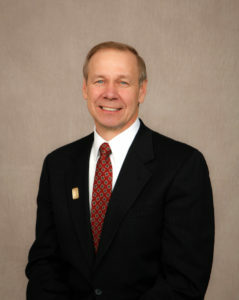 Jim Holte was elected president of the Wisconsin Farm Bureau Federation on December 2, 2012. He was elected to the WFBF Board of Directors in 1995. He represents District 9 which consists of Barron, Chippewa, Dunn, Pierce, Polk, Rusk, Sawyer and St. Croix county Farm Bureaus as well as the Superior Shores County Farm Bureau, made up of Ashland, Bayfield, Douglas and Iron counties. Jim is the President of the Rural Mutual Insurance Company Board of Directors. He is a member of the Farm Bureau Life Board of Directors and was elected to the FBL Financial Group, Inc. Board of Directors in March of 2016. Jim serves on the American Farm Bureau Federation Board of Directors as a representative of the Midwest region and is a member of the Farm Bureau BanCorp Board of Directors. Jim grows corn, soybeans and alfalfa on 460 acres of land south of Elk Mound in Dunn County. He also raises beef steers.